Atlanta, GA The Street Basketball Association (SBA) had a busy weekend in Atlanta, GA. With several players participating in many events throughout the weekend in Atlanta, the SBA had a significant presence during the NBA All-star activities. 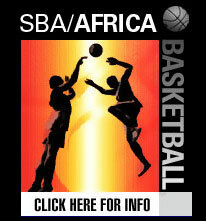 Both SBA management and players were on missions to show all that the SBA is the foremost street ball organization. Throughout the weekend SBA management met with several sponsors and is prepared to release its upcoming Spring Tour dates within the next week. On Thursday, February 7, 2003 Larry Williams AKA the Bone Collector, Randy Gill (AKA White Chocolate) and Rashid Byrd (AKA 7 and Change) got things started by playing in the Entertainer Basketball Classic (EBC)/Rucker Park game at Morehouse University. The Bone Collector and White Chocolate went head to head with the game ending in a 103-103 tie. On Friday, February 8, 2003, the Nike Battle Grounds Street Ball Competition was kicked off. The competition consisted of six two-player teams competing in a dunk contest, 2 on 2, and 1 on 1 battle. Hugh Jones (AKA Baby Shaq), Jason Williams (AKA The Helicopter), Louis White (AKA Smooth) and Keith (AKA Supaman) participated in the two-day Nike event. The Helicopter and Smooth represented their teams in the dunk contest. While Smooth was a semi-finalist, The Helicopter finished second in the dunk contest. The dunk contest was the only competition that was not dominated by the SBA. Both SBA teams beat their competitors and played against each other with Baby Shaq and The Helicopter defeating Smooth and Supaman to win the 2 on 2 competition. Later Friday, The Bone Collector and White Chocolate again went head to head in the BET/Comcast Entertainer's Street Ball Game. White Chocolate's team edged out The Bone Collector's squad at Georgia State University. On Saturday, February 9, 2003, Baby Shaq dominated all competitors in the steel cage as he was crowned the best 1 on 1 street ball player at the Nike Battle Grounds. Later Saturday, The Bone Collector and White Chocolate were at it again going head to head once more in the Dennis Scott Southern Hospitality Game. The Bone Collector's squad edged out White Chocolate's team at Georgia State University. On Sunday, February 10, 2003, for the first time since arriving in Atlanta the SBA players all got together for what was suppose to be a simple run at the Run N' Shoot, however, it turned into a spectacle as they invaded MTV & Magic Johnson's Who's Got Game auditions. While the local players, Magic Johnson, MTV producers, Coca-Cola/Sprite executives, The Rock executives and spectators came out to witness the audition, they we treated to a free demonstration of the SBA's electric style of street ball. The Bone Collector and White Chocolate dazzled all with their ball handling wizardry, while Baby Shaq and The Helicopter exploded off the floor constantly with high-flying dunks. Smooth, as always, was the team leader and 7 and Change altered shots as he controlled the paint. After several minutes of watching in awe, Magic Johnson selected Baby Shaq, The Helicopter, The Bone Collector and White Chocolate as finalists for the show to be aired in June on MTV. By Monday, the SBA once again proved it had the best street ball players and demonstrated its ability to dominate any event. WE GOT OUR FIVE GET YOURS! The Street Basketball Association is dedicated to showcasing quality street ball and providing entertainment to its audiences. The SBA is not creating a new industry with street ball we are simply legitimizing it so that it can be recognized as the true phenomenon that it has become. Whether played on dirt courts in the backyard or the asphalt of inner city playgrounds, this "street" brand of basketball boasts an unmatched passion and creative enthusiasm.